So this is a fun topic that came up in my Facebook group from one of my lovely readers wayyy back last month. With the holiday crazies and my house basically exploding from frozen pipe water damage (a story for another day), it kind of got put on the back burner. But guys, this is one of my favorites…especially since open storage is so in right now. Your kitchen is arguably the most popular place for family and guests alike to congregate, celebrate, and socialize. It is where you prepare nourishment for yourself and your family when you feel like cooking…and when you don’t (been there too many times). So how do you get your kitchen to effortlessly maintain a look that’s inviting, fresh, and function-forward…without the added clutter? I’m here to help with a few easy tips. Function Forward – Make note of where you want to be doing things like cutting vegetables and general food prep. Do you prefer to have oil out on the counter at all times, or can you tuck it away? What about salt and pepper? Do you plan to display your knives? Personally, I prefer the “knives in drawers” method, but that can be tricky with little ones so use your discretion. Make Peace With and Part With Excess Appliances – You know what I’m talking about. That rusty old blender you’ve had since college, or (in my house) that bright red toaster that doesn’t match anything. I’ve even seen a meat dehydrator and panini press assume permanent residence on display. Guys…let’s be real. If you’re not using it often enough to warrant permanent counter space, find it a cozy home behind doors. It will still be useful out of sight, I promise. Choose Your Materials Wisely – My go-to kitchen accessories are wood, white, metal, glass, books, elements from nature, and an optional accent color. Shop your Kitchen – Chances are, you already have a ton of glassware, serveware, cookbooks, and bowls on hand that will work well. You might even find something you forgot you had! Always a win. Collect More Accessories Than You Will Need – And then dial it way back. Fact: even designers arrange and re-arrange their accessories before the look is finalized. The trick in making it work is to have a large selection of items to choose from. Select Pieces that Look Pretty and Serve a Purpose – Some of my favorites are water pitchers, apothecary jars for candy or citrus, and metal wire baskets for vegetables such as artichokes. Pro Tip: When displaying produce, be sure to group only like items (i.e. a bowl full of lemons) and remove all stickers! Organic Elements – A huge trend this year, your design would not be complete without bringing the outdoors in. This could be in the form of plants, a window herb garden, fresh flowers, and/or produce. Get creative and don’t be afraid to go for the bold colors. 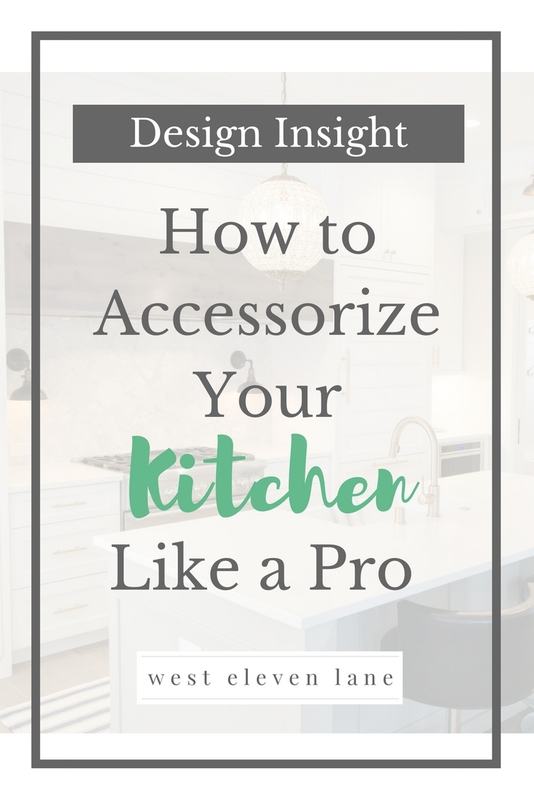 If you stick with these tips and avoid over-accessorizing, I can almost guarantee that you will have a kitchen that looks like it came straight off of a designer’s Instagram account. Let me know how it goes for you in the comments below and be sure to share your before and after pics on our Facebook page! Aww, that’s so exciting! Let me know if you have any questions that I can help with.